After two years of construction, long-awaited Hospital CMQ Riviera Nayarit has opened its doors, offering unsurpassed medical care and the best physicians and specialists in Bucerias Nayarit, in the heart of Banderas Bay. For years, residents of Bahia de Banderas and Riviera Nayarit had to travel for more than an hour to reach the nearest hospital. Once there, they faced the harsh reality of a crowded public hospital, with all its limitations. Now, everything changed with the opening of the brand-new Hospital CMQ Riviera Nayarit, the first private hospital in northern Banderas Bay, with the best bilingual team of primary care physicians, specialists and medical staff. Hospital CMQ Riviera Nayarit is always close by for your medical needs, serving the residents of: Nuevo Vallarta, Flamingos Golf Club, Bucerias, La Cruz de Huanacaxtle, Punta Mita, Higuera Blanca, Sayulita, San Pancho, Rincon de Guayabitos, La Peñita and Lo de Marcos. 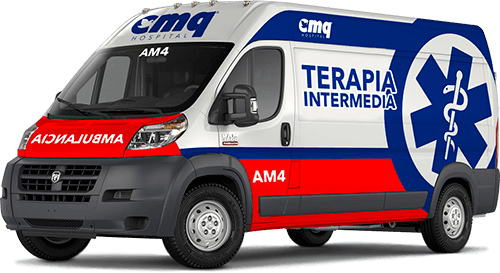 Did you know Hospitals CMQ’s Emergency Ground Ambulance Service is the only EMT in Puerto Vallarta that is included in the Canadian Consulate’s web site? We also offer affordable self-pay rates for uninsured patients. IMPORTANT NOTE: If you are planning to pay for your medical care using your health insurance coverage, please remember to bring a valid identification and your insurance card and/or proof-of-insurance. Did you know that our Hospitals are the only private hospitals in Puerto Vallarta & Riviera Nayarit that are included in the Canadian Consulate´s web site? Due to its unique location, regional coverage and excellence in patient care, Hospital CMQ Riviera Nayarit is proud to be the designated and preferred hospital for most of the largest corporations in Banderas Bay, such as Marival Hotels, Hotel Decameron, Hospital Punta Mita, Rancho Banderas and Mike´s Fishing. Come and enjoy Mexico’s Pacific Coast paradise in Puerto Vallarta and Riviera Nayarit. From Bariatric Surgery (Obesity Surgery), to Plastic Surgery and Orthopedic Surgery, our medical tourism program is the perfect choice for recovering your health in a majestic, oceanfront setting. With our hospital’s breathtaking views of Banderas Bay, internationally trained and highly skilled doctors, affordable prices and its proximity to the U.S. and Canada, our Medical Tourism Program has the perfect combination for your medical needs. Continuing with Hospital CMQ’s long tradition of excellence in medical services, Hospital CMQ Riviera Nayarit is the newest addition to its health system in Banderas Bay. Located along Bucerias’ Golden Zone (Zona Dorada) and its picturesque coastline, this state-of-the-art hospital is nestled among cobblestone streets and traditional homes with colorful facades and large wooden doors. As the largest and most advanced healthcare facility in Riviera Nayarit, Puerto Vallarta & Banderas Bay, Hospital CMQ Riviera Nayarit is open 24/7 with bilingual physicians and staff, a fully equipped Emergency Area and Intensive Care Unit, and more than twenty patient rooms with beautiful ocean views. Did you know that most of our doctors have received at least part of their training in Canada, the U.S. or Europe? And that many doctors from around the world come to Mexico to receive their training? Whenever unexpected things happen, it’s best to avoid Emergency Room wait times; in case of a sudden illness or severe injury, get immediate Emergency Care at Hospital CMQ Riviera Nayarit. With a fully equipped Emergency Area, certified emergency physicians and bilingual medical staff, our brand new emergency area is open 24/7, serving residents and visitors in Banderas Bay, Puerto Vallarta and Riviera Nayarit. Hospital CMQ Riviera Nayarit’s ICU is the only fully equipped Intensive Care Unit in Bahia de Banderas and Riviera Nayarit, just minutes away from Punta Mita, La Cruz de Huanacaxtle, Bucerias and Nuevo Vallarta. Our state-of-the-art ICU ward was designed to provide the best treatment options for patients in critical condition, with five private rooms and the most advanced technology. Supported by a team of dedicated, highly skilled Intensive Care Specialists and nurses, Hospital CMQ is proud to be the leading provider of Intensive Care Services in Mexico’s Pacific Coast. MRI: a modern technology that uses the radio waves of an advanced magnetic field to create cross-sectional images of different body parts, organs and tissues. CT Scan: a Computed Tomography Scan helps detect diseases at an early stage, by rendering images that help identify diseased tissue of different body organs. Ultrasound: Ultrasound Studies use high-frequency sound waves and a computer interface to display images of arteries, blood vessels and internal organs. Interventional Radiology Procedures: minimally invasive, image-guided treatments and/or diagnosis, which provide the advantages of a shorter recovery time, less risk and pain. Digital X-Rays: the most common and affordable medical imaging study, X-Rays are used to detect injury and/or illness in bone structures. Fluoroscopy: the use of dye (contrast material) and continuous low-dose X-ray beams, to produce images of bone structures in real-time. Cath-Angio Lab and Angiography Room: a room with specialized equipment, such as a Cath-Angio C-Arm, which enables physicians to perform cardiovascular procedures with the aid of real-time high definition imaging. From San Pancho, take the main highway “Carretera Tepic-Puerto Vallarta”, and drive towards Puerto Vallarta for 15 miles (24 kilometers) until you arrive to “Bucerias”. 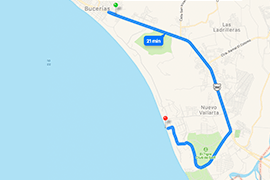 Once you arrive to “Bucerias”, continue on Blvd. Riviera Nayarit for 1/4 of a mile. Get off the main road; Hospital CMQ Riviera Nayarit will be on your right, at the corner of Blvd. Riviera Nayarit and Calle Javier Mina. From Sayulita, take the main highway “Carretera Tepic-Puerto Vallarta”, and drive towards Puerto Vallarta for 13 miles (21 kilometers) until you arrive to “Bucerias”. 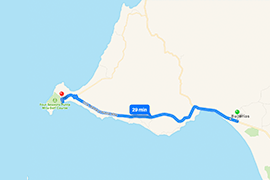 From Higuera Blanca, take the main road heading towards Punta Mita, and drive for 3.5 miles (7.8 kilometers) until you arrive to the intersection of Carretera 200 Punta Mita – La Cruz de Huanacaxtle. At the intersection, turn left to take Carretera 200 Punta Mita – La Cruz de Huanacaxtle, and keep driving towards La Cruz De Huanacaxtle. You will drive for 12 miles (20 kilometers), going through La Cruz de Huanacaxtle until you get to Bucerias. Once you arrive to “Bucerias”, continue on Blvd. Riviera Nayarit for 1/4 of a mile. Get off the main road; Hospital CMQ Riviera Nayarit will be on your right, at the corner of Blvd. Riviera Nayarit and Calle Javier Mina. 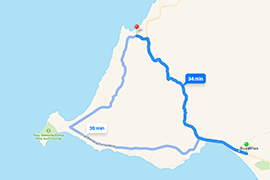 From Punta Mita, follow the main road and continue to Carretera 200 Punta Mita – La Cruz de Huanacaxtle. 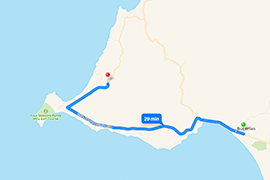 Keep driving towards La Cruz De Huanacaxtle; You will drive for 12 miles (20 kilometers), going past La Cruz de Huanacaxtle until you get to Bucerias. From Nuevo Vallarta, take Blvd. Nuevo Vallarta and head towards the main road called Blvd. Riviera Nayarit..
Once you get to the intersection with Blvd. Riviera Nayarit, turn left and keep driving towards Bucerias / Tepic. 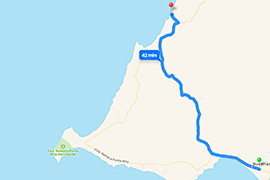 Drive for 8 miles, from Nuevo Vallarta to Bucerias. On Bucerias second stop light, make a left in Calle Javier Mina. Hospital CMQ Riviera Nayarit will be on your right, at the corner of Blvd. Riviera Nayarit and Calle Javier Mina.